If you have ever tried rolling an acoustic "popcorn" ceiling, or painted the exterior of your home with a roller and brush, you can appreciate how efficient painting with an airless sprayer can be. Graco airless sprayers come in a range of sizes from small electric models to large gas-powered machines designed for very high production and spraying heavy materials such as block fill and epoxy. Although keeping your Graco airless sprayer clean and well maintained helps to prevent break-downs, knowing how to troubleshoot and fix common problems on the job can save you time and money. Make sure the power switch is turned to "on" and the electrical outlet is live if the Graco won't start. Make sure you're not using an extension cord that's too long or an incorrect gauge for the sprayer. Try plugging the sprayer directly into the outlet without the extra cord. Also turn the pressure control knob to a higher setting; sometimes the motor will not kick on if the pressure is too low. Increase the pressure setting if the motor runs without building sufficient pressure for spraying. If this doesn't work, put the thin plastic primer tube in a bucket and release the prime spray valve lever on the side of the unit by pushing it down. Let it run until the paint flows out smoothly, then pull it back up. The sprayer should build pressure within 30 seconds. Tap the metal housing attached to the pickup tube firmly with a hammer. There is a ball valve just inside the housing that can become stuck, preventing the paint from being pulled into the pump. Tapping will break it loose. Turn off the power to your sprayer if it still won't build pressure. Release the prime spray valve briefly, then check the intake filter. Remove the filter housing and see if the filter is clogged. If it's plugged with dried paint and can't be rinsed, replace it. Remove the housing with the Graco tool kit. If you don't have one, a crescent wrench works fine. Clear the tip if it becomes clogged. Using a "reverse-a-tip" makes it very easy to clear a clogged tip. Simply twist it around and trigger the gun briefly so the pressure blows the debris out. If you are not using a reversible tip, remove the tip with the Graco tool or a crescent wrench. Scrub it with a bristle brush, or poke the debris out from the inside with a pin. Never poke from the outside or you'll ruin the tip. 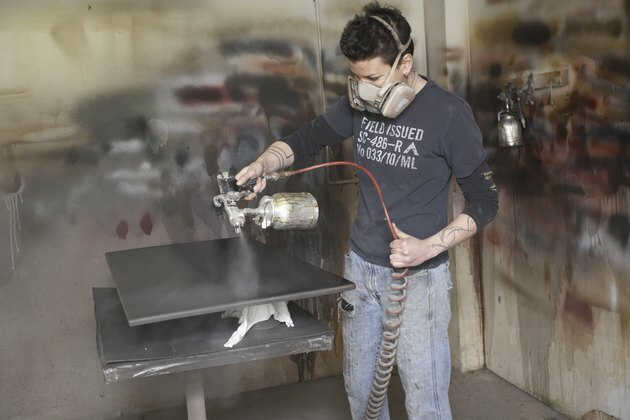 Use the correct tip for the material you're spraying. There are many different tip sizes. The wrong size, or a worn tip, will result in an improper spray pattern or frequent clogging.